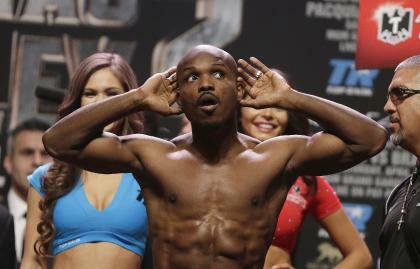 LAS VEGAS – Timothy Bradley believes the secret to beating Manny Pacquiao on Saturday is intimidation. It's an approach he's pursuing with vigor, words, actions and even his choice of walk-in music. Ahead of the much-anticipated rematch for the WBO welterweight championship, Bradley has tried to turn up the heat on Pacquiao at every opportunity, with the normally reserved Californian launching verbal barbs and slights and questioning his rival's heart. And Bradley will ratchet things up another notch on fight night, having appointed rap star Fashawn to lead him into the ring with a gritty and aggressive track titled "Champion" that he insists will tip the psychological edge further in his favor. Fashawn, a rising celebrity in the hip-hop world who has performed around the world and is best known for his debut album "Boy Meets World," understands his role at the MGM Grand is about more than just entertainment, and wants to play his own part in getting inside Pacquaio's head. "My plan is for this to motivate Bradley, pump him up and give him that energy that he needs to win the fight," Fashawn told Yahoo Sports. "I hope it intimidates Manny and makes Manny see that he didn't know what he is getting himself into. "Bradley and I have had a pretty tough road to get to where we are, that is something that me and him in particular have in common. In the record I hope he finds something that draws on that, enforces in his mind that he is invincible and has the heart of a champion." These fighters squared off in June 2012 with Bradley emerging victorious via a split decision that was one of the most disputed in recent boxing history. Most experts struggled to find more than a handful of rounds that could have been scored for Bradley, yet judges Duane Ford and C.J. Ross both had it 115-113 for the American. Bradley might have won, but he also lost in a way – his credibility taking a major hit and the ensuing negative publicity throwing him into a mental funk. Nearly two years later, and with victories over Ruslan Provodnikov and Juan Manuel Marquez behind him, he claims to now feel empowered by those tough times. He has a new, bolder mindset, and is no longer star struck by the bright lights of Vegas. He has a point to prove. "You can see it in his eyes," said Fashawn, who has spent much of this week in the camp of Bradley and his family. "A man is dangerous when he has been hurt on a personal level. For every champion there is a time in your life when that moment arrives, and it is time to seize it. I sense that in him right now." The track that will ring in Bradley's ears as he heads to center stage on Saturday was originally made by Fashawn several years back, but was adapted to focus on Bradley following his brutal victory over Provodnikov – the 2013 Fight of the Year. Bradley heard the record and enjoyed it – and the two have subsequently struck up a friendship. "What I like about this is that it is real hip-hop," Bradley said. "It is about heart and character, not about partying it up in a club or all that kind of stuff that so many records are about." Pacquiao is a -260 favorite for the fight, with Bradley at +210. While Pacquiao's attention has largely been focused on his political career in recent times, he remains one of the biggest draws in the sport, evidenced by a solid crowd of several thousand for Friday's weigh-in. 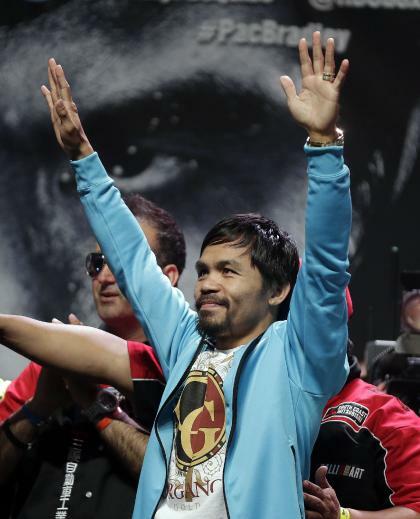 Both men looked relaxed, Pacquiao sporting his trademark grin while Bradley cheekily invited boos from the pro-Pacquiao crowd before blowing the fans kisses. Pacquiao tipped the scales at 145 pounds, with Bradley at 145.5. One theory is that Bradley's more aggressive psychological approach might be a ploy to goad Pacquiao into engaging into a more reckless offensive style during the fight. We don't have to wait long to see if it works.